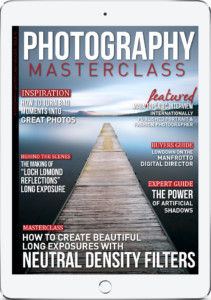 Learn How To Create An Instant Fairy-Tale Like Feel To Your Images Using ND Filters, In This Issue of Photography Masterclass Magazine! ND filters are without a doubt an essential piece of kit for any landscape photographer. Silky smooth water and streaking clouds can give an instant fairy-tale like feel to your images. In this issue we look at everything you need to know about using ND filters to create really beautiful images which really stand out from the crowd. + Award-winning fine art photographer, Marius Vieth, gives us his insights on turning bad moments into great photos. + In our expert guide, we reveal exactly how to use the power of artificial shadows to create seamless composite images. + We interview internationally published portrait and fashion photographer, Maja Topčagić who's been getting a lot of attention online recently, especially with her creative portraits of redheads! + You'll go behind the scenes in a great video tutorial to see exactly what went into creating the stunning long exposure cover image on this magazine issue. + We showcase an incredible timelapse of the Milky Way, filmed over 11 nights on the ‘dark island' of La Palma in the Canary Islands. + We also give you the lowdown on the Manfrotto Digital Director, which allows you to use your iPad to remotely control your camera and take images, videos and timelapse.